TEHRAN (FNA)- Expediency Council Chairman and former Iranian President Akbar Hashemi Rafsanjani took the US, its allies and hirelings in Syria responsible for the chemical attacks in the Muslim country. “The US had prepared everything beforehand and they themselves have stated that they had known the chemical materials were due to be used three days before the attack took place,” Rafsanjani was quoted as saying by an informed source in the latest meeting of the Expediency Council in Tehran on August 31. His remarks came after certain western media allegedly reported that Rafsanjani has blamed the Syrian government for the chemical attacks against the Syrian people. The militants operating inside Syria and the foreign-backed Syrian opposition claimed on August 21 that hundreds had been killed in a government chemical attack on militant strongholds in the Damascus suburbs of Ain Tarma, Zamalka and Jobar. The Syrian government has strongly denied the claim, accusing the militants of the attack. 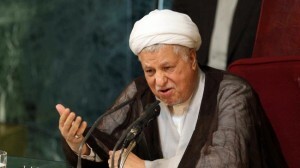 The source, who is an Expediency Council member but called for anonymity, also quoted Rafsanjani as calling on the Iranian officials to act vigilantly and wisely in the current situation and continue support for Syria. “Support for Syria and Lebanon should continue since these countries are in the forefront of resistance against Israel,” the source quoted him as saying.